I, along with the others in the group, had to wake up by 5:30 AM, freshen up, have breakfast and leave. I was not so confident about the state of my stomach but last evening’s dosage of Loperamide appeared to have done its job. I had no issues for the rest of the day. 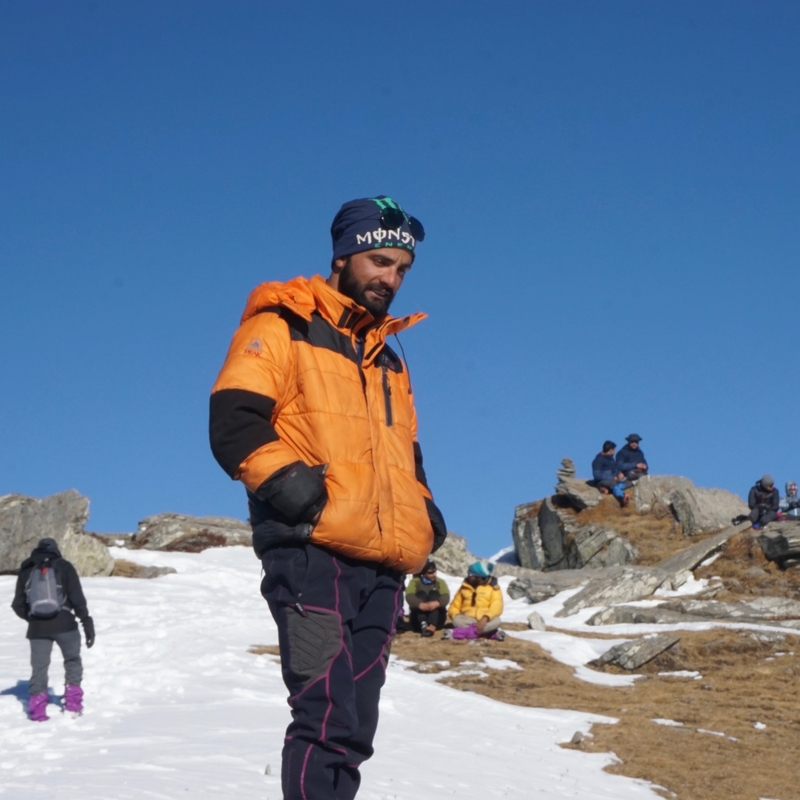 One of the trekkers was ill and skipped the summit. He had already done the trek some three or four years ago. The rest of us, led by Dev, headed out with our daypacks and torches. Gradient was slightly steeper than the last two days but it wasn’t that bad. 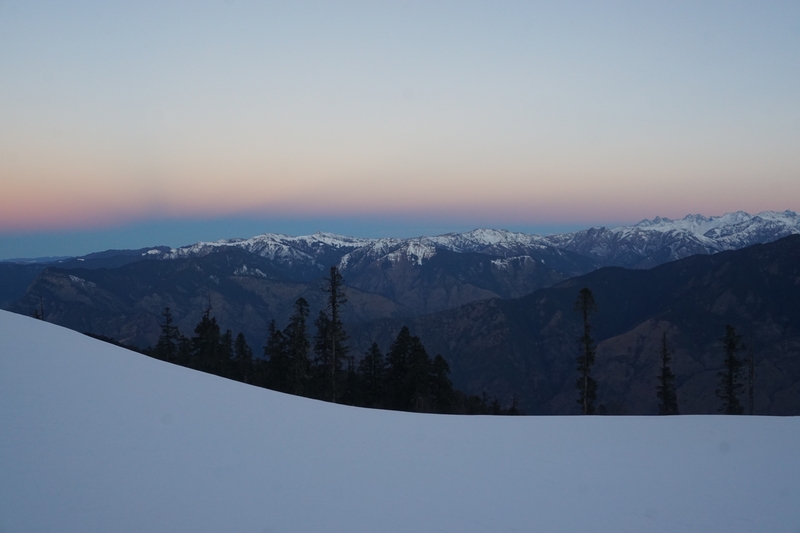 Along our way, as the sun rose beyond the mountains, the sky was filled with colours—like a horizontal rainbow. The picture doesn’t do much justice to the actual sight. About two kilometres of hiking through pine and golden oak led us to Munaila (MSL 11200 ft appx.). 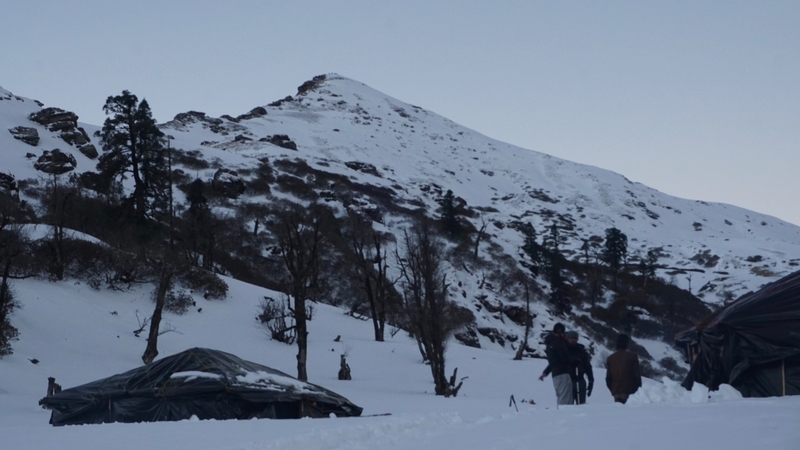 There were two dhabas amidst flat meadows that served as Kedarkantha basecamps. These served tea, Maggi and omlette to trekkers. The entire area was covered in a blanket of snow. This was the first time that the peak was visible without any obstructions. From here it was a steep, half a kilometre ascent to the peak. About eight of us, who were relatively fast, reached there pretty early. My stomach felt better and I had two teas—the first being refreshment and the latter to kill some time. Kedarkantha peak from the dhabas. About half an hour later, Dev, decided to take the faster batch first. We were losing a lot of body heat just by staying there. 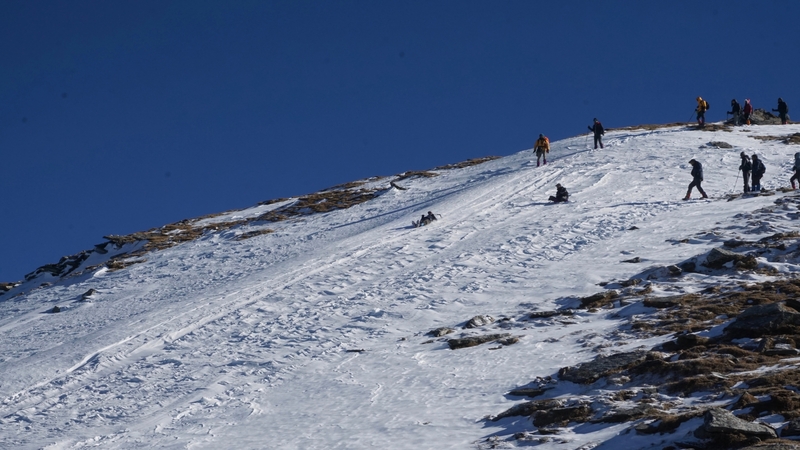 The climb to Kedarkantha peak was steeper than the terrain below. The trail followed through ridges and slopes. Four Himalayan griffons circled around the peak. They acted as a mental marker regarding the location of the actual peak since there were two false peaks that would fool a trekker. A quick rest just below the summit. We reached there exactly at 9:00 AM. 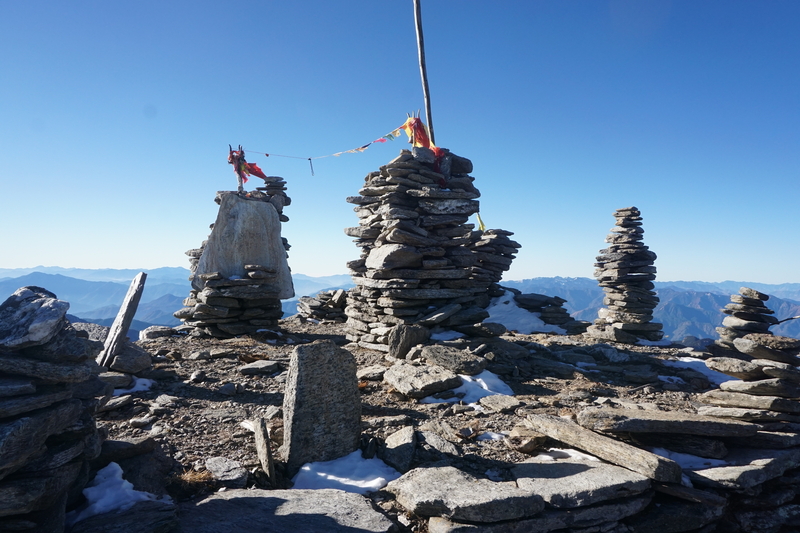 There were a lot of cairns all around the peak. In fact, the temple itself looked like so. The slower group gave us an hour of extra time to enjoy the atmosphere and the surroundings. The air was standstill and the sky was clear, giving us ample amount of warmth. There was also a more modern looking, concrete Ganesh temple on the slopes behind the Shiva temple. BSNL and Idea were the two service providers whose signals were available. I had left my BSNL phone back in my rucksack and had to borrow a fellow trekker’s phone (Idea) to make a call to my home. The call quality was surprisingly very good. 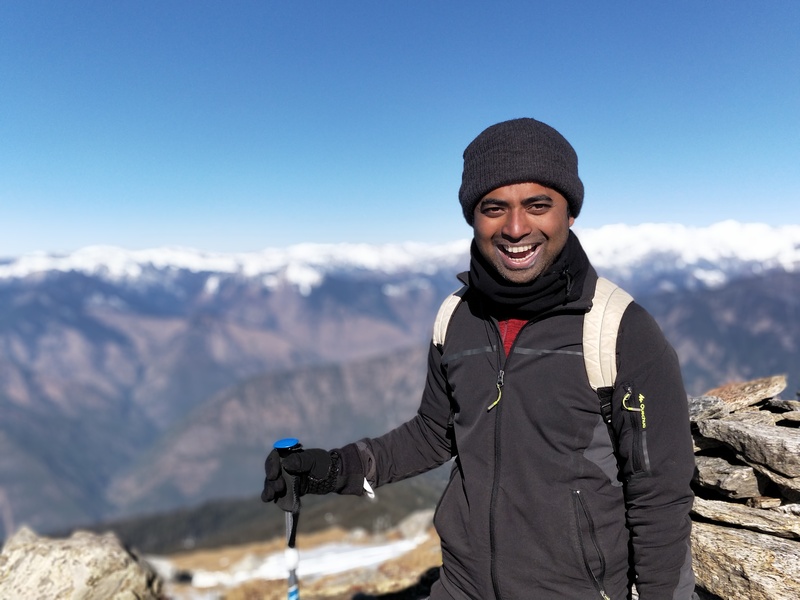 Karthik, who is usually a very jovial and accommodating man, lost his cool when one of the kids slowed down the trekking team by stopping to take snaps. I am not aware of the backstory—and I don’t intend to know it—but I heard him say, “If you take another picture, I am going to throw your camera all the way to Sankri.” There is something that I learned a long time ago. 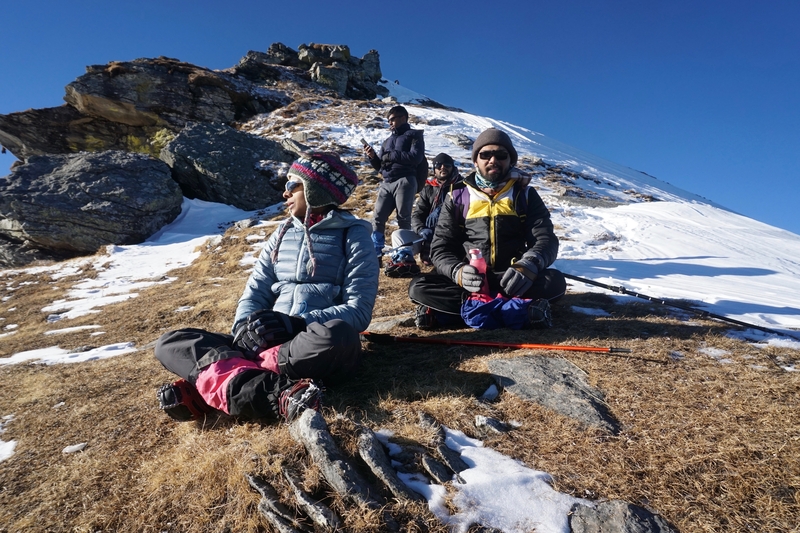 When in a trekking group, if you have to take photographs, observe nature or collect samples—some activity that may involve some time—it is best to be a fit and fast trekker. Once, everyone had gathered around, Dev walked us all through each and every range and the important peaks visible from Kedarkantha top. After that, we posed for a group photo before heading downwards. And a solo picture. PC: Karthik. Dev showed us how to make a snow slide and slide all the way down. He had previously instructed us on the safety aspects and elbow braking. It was one of the most fun things I had done. That’s how you slide down a mountain. 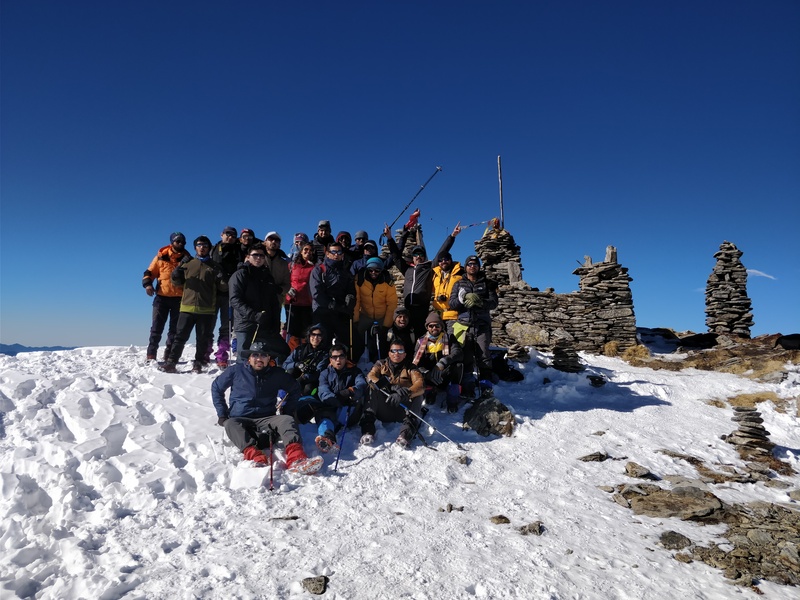 Another batch of trekkers from Indiahike’s regular batches were supposed to be headed for the summit from the other side. They weren’t there even at 11:00 AM, when we had slid all the way to Munaila. I felt hungry but did not want to order Maggi. Preparing that would have been too time consuming. I remembered the venerable Ugyal T. Lama’s method of crushing a packet of noodles and sprinkling the tastemaker inside to make a mixture of some sorts. 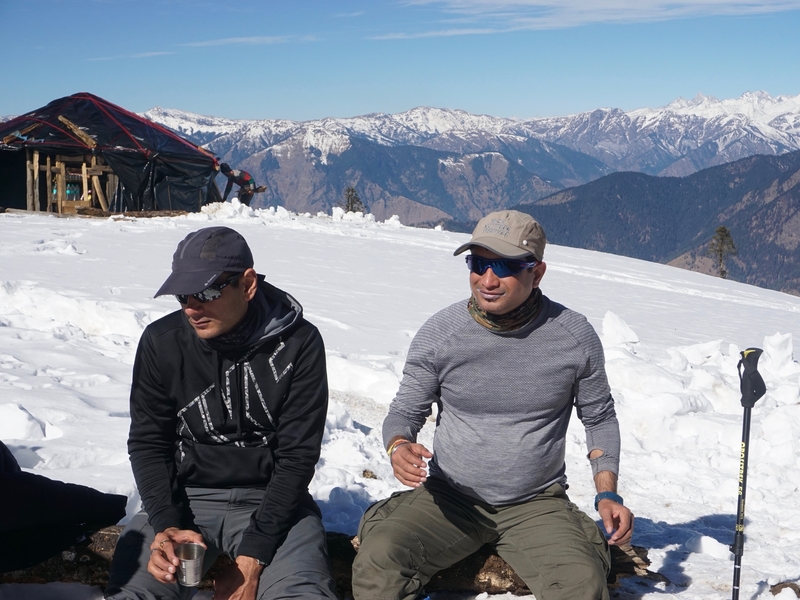 Siddharth and Shubhajit met last year at Sandakphu and became good friends. They decided to do Kedarkantha this year but when it was all booked out, they opted for Har-ki-Doon instead. 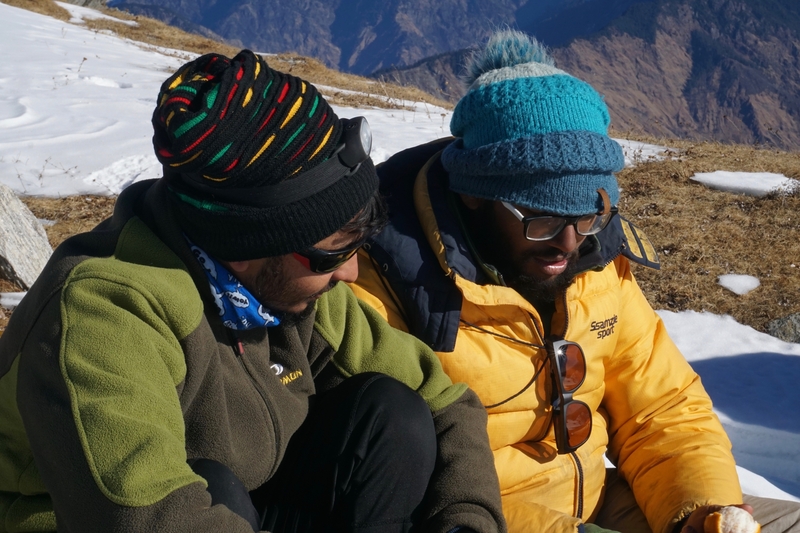 As luck would have it, they had just finished summiting Kedarkantha! Dev showed me that running is a far viable option than descending slowly. Not only does it reduce the number of times one has to do pistol squats but also exposes the knee to impact for a lesser amount of time. I had the micro-crampons on which boosted my confidence enough and made running downward even more fun. I ran all the way to Luhasa camp. We were served our lunch at Luhasa. 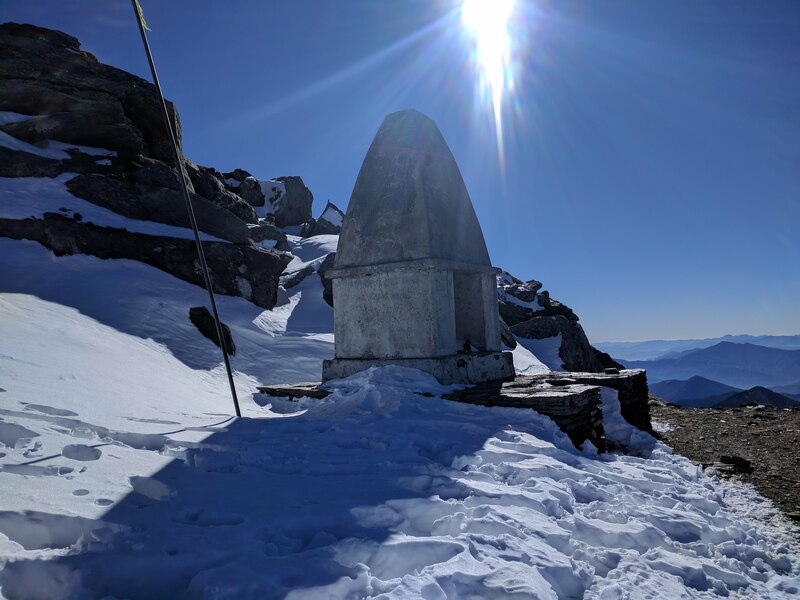 We were informed that Hargaon campsite was still snowed out and so we were asked to pack all our belongings so that we could descend to Juda-ka-Talab campsite instead. Another batch of trekkers had already started coming in. They would be headed for the summit the next day. 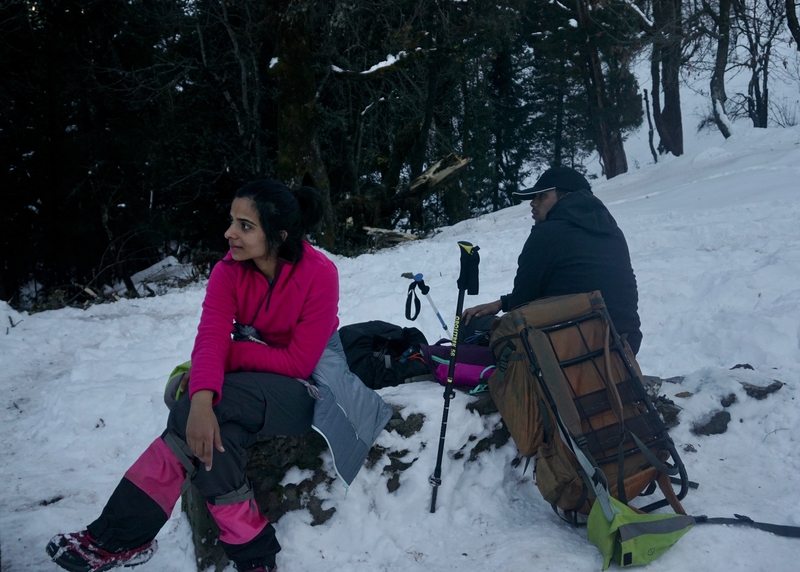 I ran, just like Dev had instructed me, till a resting spot where we waited for the trekkers to gather. As soon as they were visible, we headed down again. Varsha and Akshay had gotten engaged recently and were taking some time off before they were headed to ISB Hyderabad. Unlike yesterday, Juda-ka-Talab was bustling with activities. There were a lot of people and the flatlands had become quite muddy. A group was being instructed on river crossing at JKT. Our campsite at Juda-ka-Talab was busy with another batch who had to alter their plans just like us. As a result, the dining tent was crowded but it was fun hearing Karthik’s cooked up ghost stories along with the other batch of trekkers. The snow had compacted and melted quite a bit in the last two days. This made the surface very slippery. Thankfully, I still had my micro-crampons on. Also, even though there wasn’t ay fresh snow, I felt that the temperatures had dipped. I had to go to sleep with an additional layer of fleece.